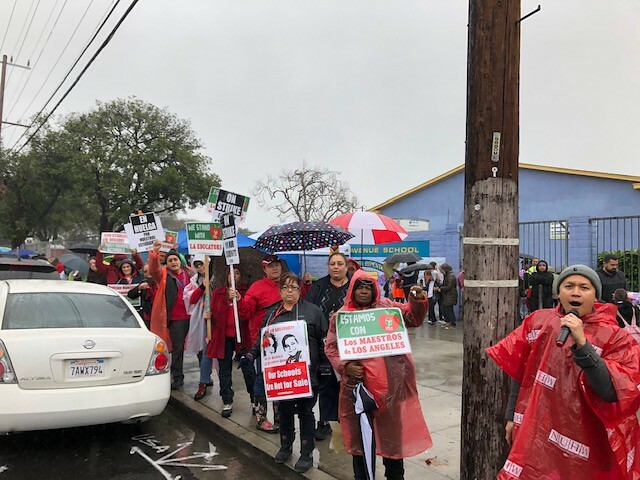 × BARGAINING UPDATE: Jan. 16, 2019 — The district has accepted our offer to bargain tomorrow with Mayor Eric Garcetti mediating in an effort to help us work toward an agreement. State Superintendent Tony Thurmond has also been in touch with both parties and offered support in the process. We will be ready to bargain tomorrow and our team will work long and hard towards an agreement that benefits our students, members and communities. Watch Officer announcement on Facebook Live. Our voices echoed across the District today with our press conference at Hamilton HS with Diane Ravitch and musician/actor Steven Van Zandt walking with students, parents and teachers at Hamilton High School. Our seven regional rallies brought our members, parents, students and community supporters in droves despite the rain. Public education luminary Diane Ravitch and musician/actor Steven Van Zandt walking with students, parents and teachers at Hamilton High. Tens of Thousands of members, parents and students flooded the streets and rallied at each of seven regional actions throughout LA. 100 percent of LAUSD schools with teachers on strike. On Tuesday, April 9, 2019, an overwhelming majority of the educators at two Alliance College-Ready Public Schools, Morgan Mckinzie and ESAT, filed cards with the California Public Employment Relations Board (PERB), authorizing United Teachers Los Angeles as their union. The first time I heard of Reclaim Our Schools Los Angeles was through Cesar Castrejon, an organizer at ACCE who led a meeting at my Parent Center at Tenth Street Elementary School. He shared a lot of information about what teachers were fighting for, and he told us that LAUSD has a $1.86 billion reserve that was not being used.